The Venetian christened its signature rose, The Venetian Rose, on Aug. 14. The Venetian Rose was inspired by legendary love stories such as William Shakespeare’s “The Merchant of Venice,” depicting true love conquering all. It has taken years to develop its high petal count and bi-coloring. This rose has limited availability, and is grown in Ecuador, the world’s third-largest exporter of cut flowers, especially for The Venetian. 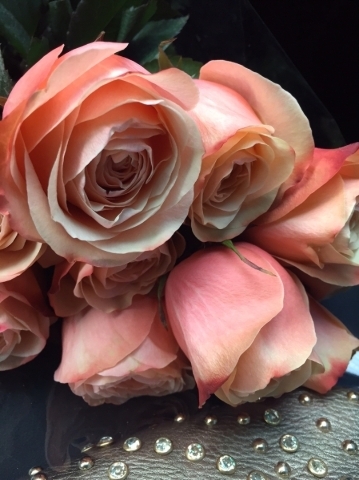 The peach and champagne hued rose was chosen as a complement to the Palazzo Rose, which was introduced in December 2012. The ceremony was led by Lipshtick comedian Loni Love, who traveled to the ceremony via The Venetian’s wedding gondola, adorned with Venetian Roses. Add a hostel to Las Vegas’ hospitality options. Downtown Las Vegas visitors can now stay close to the excitement of Fremont Street at the recently remodeled Las Vegas Hostel. Owned and operated by Downtown Project, the Las Vegas Hostel offers travelers accommodations starting at $15 a night. The redesigned three-story property includes 38 private and shared rooms housing 154 beds. Since early this year, the Las Vegas Hostel has undergone upgrades to the lobby, kitchen, dining, and pool areas as well as improving rooms with the addition of new mattresses, bedding, and furnishings. Each room comes complete with an en suite bathroom. The hostel also offers a stadium-style entertainment room, common areas and an improved sound system, as well as complimentary wireless Internet and breakfast for guests. The property offers a new bike sharing program and various guided tours. Visitors can also take advantage of the newly redone pool area and community barbecue. Those interested in staying at the Las Vegas Hostel must be at least 18 years old and an out-of-state resident. Guests can view and book rooms on the property’s redesigned website at LasVegasHostel.net. Reservations can also be made by calling 702-385-1150 or 800-550-8958. On Aug. 19, the Henderson Chamber of Commerce will celebrate the 15th anniversary of the Henderson Business Resource Center and its newest tenant, Home Helpers and Direct Link of Henderson. The Henderson Business Resource Center provides support services and resources tailored to young companies. The goal of the resource center is to create jobs in the community, enhance an entrepreneurial climate and retain businesses while diversifying the local economy. The Henderson Business Resource Center has helped businesses such as Imagine Communications, Desert Living HOA, American National Insurance (Gavin Walker Agency), K2 Energy Solutions, Nevada State High School, We the People, Creative Property Solutions and others. Home Helpers and Direct Link of Henderson, a USAA Bank veteran-owned business grant recipient, provide in-home care and support for people in their homes, retirement communities, assisted living and skilled nursing facilities. The Henderson Chamber of Commerce Foundation is a nonprofit corporation organized to manage and distribute money and resources to further the development of the community through activities that are exclusively charitable, scientific, or educational. The foundation is responsible for the creation and success of both the Henderson Business Resource Center and the Leadership Henderson program. A ribbon-cutting ceremony, which is open to the public, will be from 11:30 a.m. to 1 p.m. Aug. 19 at the Henderson Business Resource Center, 112 S. Water St.